As soon as you set foot in your departing airport, first class travelers check-in at their own location. No lines, just minimal waiting. At the desk, travelers have the option of checking in additional bags for no extra cost, a perk in and of itself. Those shopping spree purchases can fill your suitcase quickly, and bringing them home with no charge is something no one will argue with; Plus, there’s no need to worry about your belongings—security has you covered with limited first-class access and specialty baggage care. So, you’ve checked in and your bags are out of your hands. What do you do with the extra time? Lounge, of course. First class travelers have access to some of the finest lounges in the world, often with free drinks, food, and Wi-Fi access. These calm and secluded areas make travelling enjoyable and prove to be invaluable in crazy times when your flight is delayed. On your first class flight, you’ll have the opportunity to indulge in food and drink. On short flights, you may only have access to delicious snacks, but on flights two hours or longer, passengers will be treated to incredible meals prepared by world-famous chefs, with world-class wines, and enough drinks to make happy hour last the entire flight. Many first class travelers will receive travel kits with items rivaling your own personal-care routine. Some kits have been known to carry Birchbox items like Caudelie, Clarins and Crabtree & Evelyn. Pillows, sealed blankets and reclining chairs that double as beds are also found in the first class cabin. Some airlines have offered Swarovski-studded watches and clutches, embroidered pajamas, and Givenchy-made linens. It’s not a surprise finding large monitors for movies at each seat, and showers to freshen up before landing. The décor in these cabins are unmatched by any other location on the plane. Large seats, beautiful color schemes, art, and flowers in vases will provide any traveler with inspiration for their own home’s design. The space between seats will never have you wondering “Is this my armrest?” and you’ll never feel suffocated between two people ever again. And the leg room? Utter and total sweetness, especially for tall folks. Is it really a surprise that flying first class is full of perks? There’s a reason why flying first class makes some green with envy: it’s the perfect way to travel. 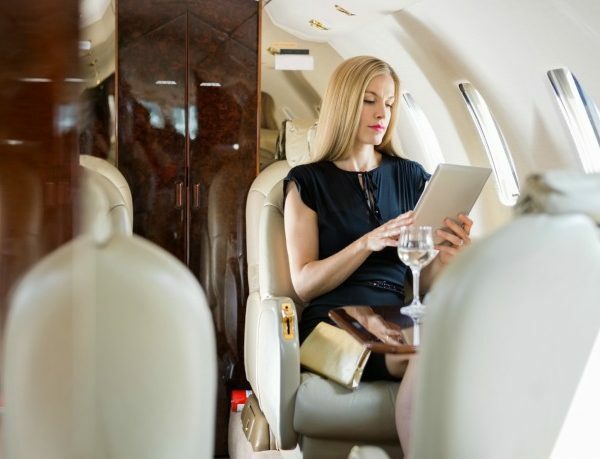 The appeal of stress-free travelling and VIP treatment is a siren call to travelers all over the world, and can be experienced by anyone through Fly With Class. Whether you travel once per year or once per week, there’s no reason you can’t give yourself a luxury experience flying with class.